The Red Bull Holden versus Shell V-Power Ford battle that had simmered across the opening half of the season finally boiled over at Sydney Motorsport Park in August. Shane van Gisbergen broke ranks by passing Scott McLaughlin for the lead on a Safety Car restart, banging doors with the Falcon as he went by on the front straight. McLaughlin returned serve by tapping the back of his rival at Turn 2 – with a second hit spinning the Commodore in front of the field, damaging several cars. Stewards came down hard, punishing both drivers for their indiscretions, with McLaughlin receiving in-race and post-race penalties following a further analysis of the contact. The dubious honour of first to crash at Bathurst this year went to Tim Slade and the hapless Brad Jones Racing. BJR’s hopes to turn around a year littered by crash damage with a big Bathurst came unglued halfway through the opening session when Slade found the wall at The Esses. Two fabricators were summoned from BJR’s Albury base to affect an overnight repair, adding to a workload that had included a rushed build of a new CoolDrive Commodore pre-event. It was just the start of a dramatic week for Slade, whose co-driver Ash Walsh withdrew due to injury on Friday morning, before cooling issues made for a nightmare race. For the second year in succession, the Sandown 500 featured an extended red flag stoppage after a crash at Turn 8 on the opening lap. This time the victim was Taz Douglas who, like James Golding the year prior, suffered tyre damage in the hustle and bustle of the opening corners. Failing at the end of the back straight, the tyre drama pitched the Lucas Dumbrell Holden off at high-speed and into the tyre barrier. Although there were no injuries, it was one of several big Turn 8 impacts across the weekend that put safety at the ageing circuit in the spotlight. A spate of tyre failures struck during the two 250km races at the Phillip Island 500 but, remarkably, none resulted in big incidents. That was saved for the dying minutes of Friday’s opening practice, as Craig Lowndes came off in spectacular fashion at the Hayshed. The veteran later said he had no warning before the right-front blew at well over 200km/h, causing the Holden to slide across the gravel and into the earth-filled tyre wall. Triple Eight’s crew had the car back on track by Saturday morning, but the dramatic weekend of tyre problems was only just beginning. Facing an uncertain future as he neared the end of his Garry Rogers Motorsport contract, James Moffat was having one of the races of his career at Bathurst before it came unstuck. Running third as the race entered its final 20 laps, Moffat spun at McPhillamy Park, making rear-on contact with the tyre wall before rejoining with, remarkably, only superficial damage. The dicey conditions caught him out again just laps later, however, this time sliding wide past the grate at Sulman Park and making heavy side-on contact with the concrete. 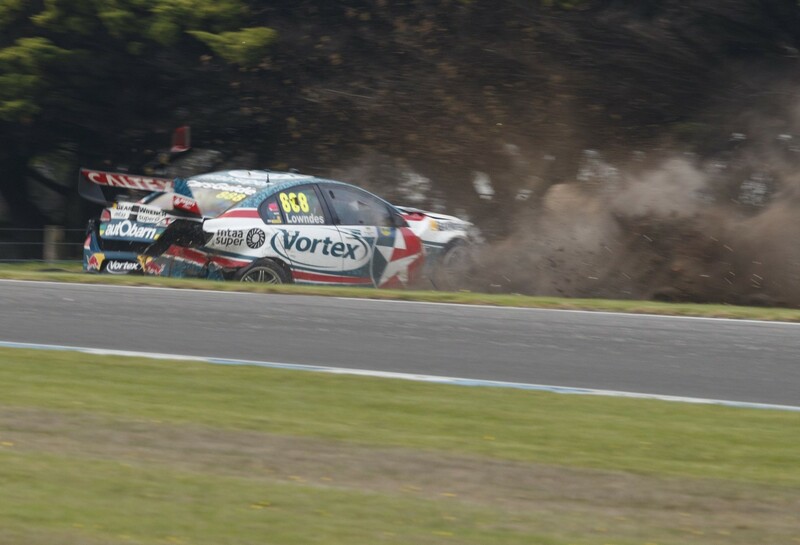 It was Moffat’s second big hit of the weekend following a crash in The Esses during qualifying and meant the battered chassis spent two events on the sidelines.